You’ve all seen them, short videos (usually under 15 seconds) that disappear from your social feed within 24 hours. When the disappearing photo was first introduced by Snap in 2011, it was new, exciting, and confusing. (maybe it still is!?) Now, times have changed and it seems like everywhere you look these days it’s all about stories, and this is only going to grow in 2019. In fact, Mark Zuckerberg is betting even bigger than he already has on the stories format. With stories being so “of the moment”, it seemed like the perfect time to run some more tests and see how different types of promoted stories perform. We used Facebook’s Split testing platform (as always) for this test and targeted Instagram stories. 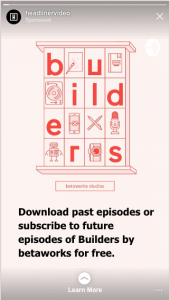 We partnered up with Builders Podcast by betaworks, thanks to host and producer Laila Oweda. For this we thought we might as well start off and of re-do our original split test, but adapt it for IG stories. We pulled a clip from Episode 13 of Builders, which featured one of my favorite people in the world of audio, founder of Gimlet Media, Alex Blumberg. We put these video units into a Traffic Acquisition Split test along with the static image. Going into this test I thought for sure that Alex Blumberg’s beautiful mug would win the campaign hands down, but no! In terms of Cost per Click, Animated text was the winner, followed by the static image of the Builders Podcast logo, followed by the image post (Sorry Alex!). These results are contrary to what we found on our Facebook split tests (where image and video beat out text), and highlight potentially a different aspect of stories to consider – animated text alone can drive good engagement, so next time you’re going to promote something on IG Stories, give text a try.